In 1988, I became an employee at Electronic Arts. My task was to write a game for IBM and DOS compatible computers. EA had previously only done the publishing and was just starting its internal development teams. (I had been a contractor for Skyfox). Mike Kosaka had designed their first game developed in house, Skate or Die, which was very successful. He teaches Aikido and holds a black belt, so a martial arts title was a natural choice. 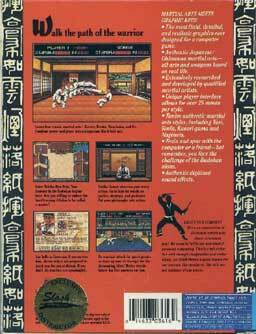 VGA graphics cards had just come out, so this was one of the first games ever published using 256 color graphics. The new colors made for a fantastic improvement in visual quality, but we had to make the game compatible with EGA, CGA and monochrome also. It made for a challenge in both art creation and data storage. The most fluid, detailed, and realistic graphics ever designed for a computer game. 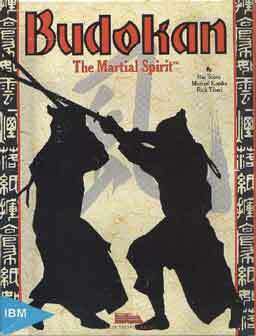 Authentic Japanese / Okinawan martial arts - all arts and weapons based on real life. Extensively researched and developed by qualified martial artists. Unique player interface allows for over 25 moves per style. Twelve authentic martial arts styles, including Yari, Tonfa, Kusari-gama and Naginata. Train and spar with the computer or a friend - but remember, you face the Budokan alone. We had a fantastic team of artists: Mike Kosaka was art director as well as game designer, and he and Connie Braat did the fighting animation. 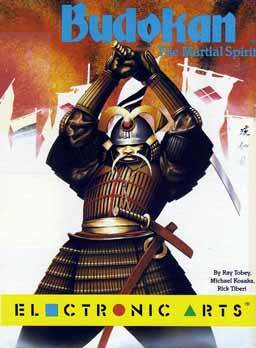 Mike Nowak drew the distinctive dojo backgrounds. Cynthia Hamilton's portraits of the tournement opponents looked suspiciously like members of the development team. Mike Lubuguin did background animation. Look for his dragon in the pond! I had help programming from Rick Tiberi, who came from Xerox Parc, and Sefen Hsu. Rob Hubbard did the sound and music. Mike Isgur helped as art wrangler, and Steve Landrum as technical director. The PC speaker was the most common sound mechanism at the time. It could only play a single square wave tone, and it sounded awful. I wrote a pulse code modulator that played multiple voices by changing the frequency of the square wave about 4000 times a second. You could recognize the sound as multi-voice music, but Rob Hubbard dubbed it the fuzz organ. The large amount of art data initiated years of study into compression algorithms. I wrote an LZW codec to fit Budokan onto two floppy disks. This earned me a "star achiever" badge when Dave Bunch used it on a port of Skate or Die. We worked on the game for about a year and half. At one point, accounting asked everyone to fill out time sheets each day allocating our hours to the various projects. My total after a week was 110 hours! I told my boss, Greg Riker, that I didn't want to know how much time I was putting in. I was pretty amused by the recent lawsuit against Electronic Arts. A programmer's wife, among others, had complained about the overtime. Greg was eventually promoted, and Richard Hicks became my boss. After a while, Greg told him that Richard was making Greg look bad with his puny expense reports. Greg had spent a lot more when he held that position! Richard and I had a lobster dinner that night, on the expense account. When Sega and Nintendo released the Genesis and SNES consoles, Electronic Arts started a clean room reverse engineering project. One team took the systems apart, while another wrote manuals describing how they worked and created development tools for us to use. The key was that the two teams could not talk to each other. They eached talked to the lawyers, who made sure that no protected information was exchanged. Budokan and Populous were EA's first two products developed after this tedious process. John Tomlinson ported Budokan to the Sega Genesis and Michael Schwartz tackled the Amiga. Commodore 64 and ZX Spectrum conversions were done later. When I started working at the EA offices in 1984, we had maybe 25 people. Every Friday at 5, the whole company gathered around the conference table for food, drinks and an update of the week's events. While I was working on Budokan, Electronic Arts went public. It now had more than a thousand people all over the world. The character of the company had changed, so I returned to the life of a contractor.